If you are new to HWU – welcome – we hope you enjoy your time with us. Take a look at our Getting Started Guide to find out about the Library and IT services at Heriot-Watt. If you are an existing student – welcome back…. The following tips/suggestions might help you get your return to work off to a good start. 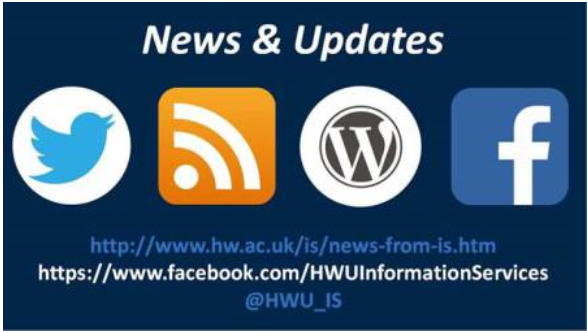 And don’t forget to follow our Twitter, InformS and Facebook pages to keep up to date with what’s happening. We wish you a happy and successful 2016.